A 16-year-old black boy presented with complaints of shortness of breath, dyspnea at rest during the last month. Examination revealed a wide pulse pressure and a continuous murmur across the precordium. 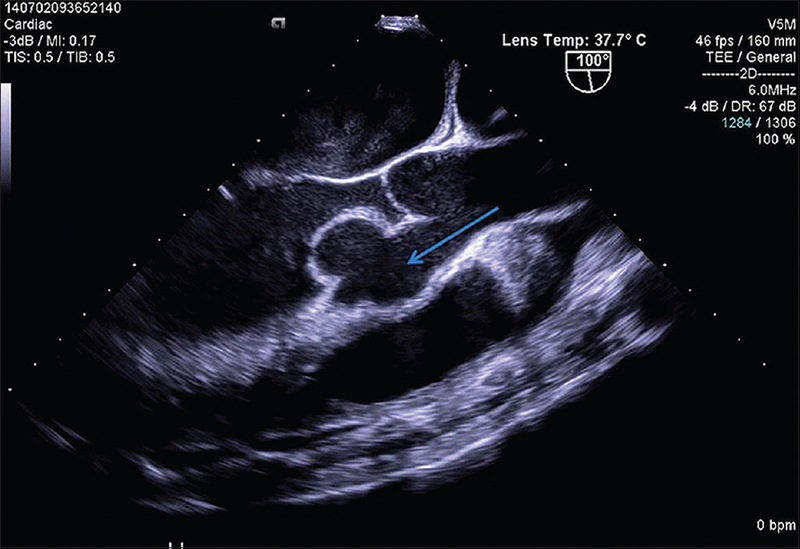 The transesophageal echocardiogram showed a ruptured aneurysm of the right sinus of valsalva. The sinus rupture dissected into the interventricular septum [Figure 1], [blue arrow] and then into the left ventricular cavity [Figure 2], [white arrow]. The patient underwent surgical correction of the defect successfully. Aneurysm of the sinus of valsalva account for only 1% of congenital cardiac anomalies. Of this aneurysm, 70% arise from the right sinus of valsalva. Most of the remainder arises from the noncoronary sinus and <5% from the left coronary sinus. Unlike others populations, in Africa, the rupture into the interventricular septum is the most frequent complication of these aneurysms, followed by rupture into the right chambers. However, the simultaneous rupture of sinus of valsalva aneurysm into the interventricular septum and the left ventricle is an extremely rare heart condition. 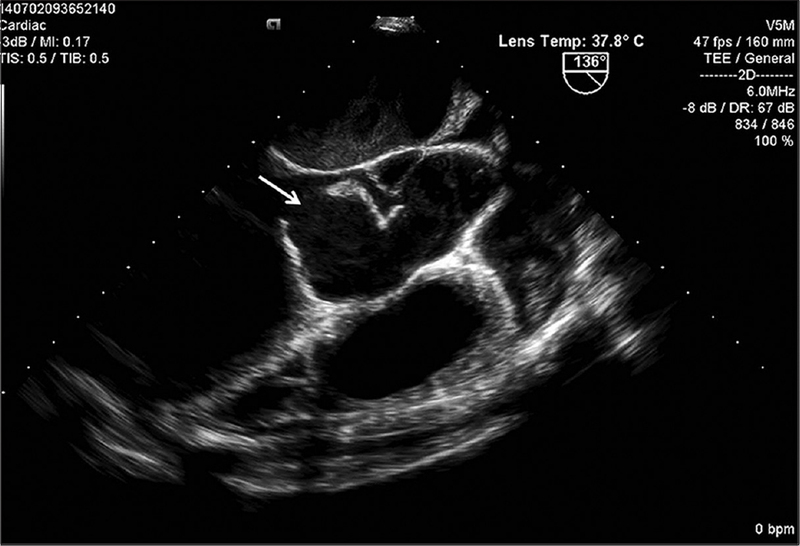 Morais H, Cáceres-Lóriga FM, Martins T, Vanduném G, Cunha R. Unruptured congenital aneurysm of the sinus of valsalva in an African population: A six-year experience at an echocardiography laboratory. Cardiovasc J Afr 2009;20:192-5.